Is that Huginn and Muninn I see in the tree there? I was wondering if someone would know who those little ravens were. ;D Good job! Umm… Last few pages? Your dialogue? I love. ‘Hmmmm’ is right. What is he up to now? Trying to turn Coal against his original mission? They’d better choose their next words carefully because it looks like Hugin and Munin are eavesdropping. You got that right. It’s like Viking Age Big Brother! Can’t escape it. This page is just oozing with excellence. I love that you tossed Hugin and Mugin in there, and I get a real sense of epic foreshadowing with this conversation. You’ve got me SO HOOKED. Awwww, of course you got mentioned! I still loooove that drawing omg so much. X3 Can’t gush enough! Heh, along the lines of “Those who have absolute power need it reduced just enough that they will learn a little humility”. Eeep. Upon a second read-through, I declare this to be the most impressive page of the whole comic to date, from a scripting POV. First there’s good old Huginn and Muninn being all ominous, and then we get that close-up on Loki’s face/eyes. 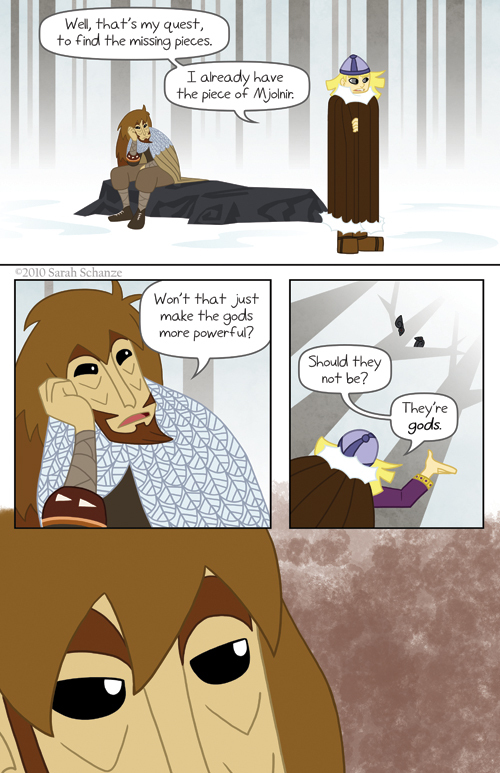 Somehow the lack of discernable expression makes that panel all the more powerful, ‘specially since by Ragnarok we know he’s rather violently not of Coal’s oblivious opinion. Oh, Loki.